Under Section 106 of the National Historic Preservation Act federal agencies and their delegates must consult with the State Historic Preservation Offices, (SHPOs) Tribal Historic Preservation Offices (THPOs), local governments, applicants and interested individuals and groups. Consultation addresses any potential impacts that federal projects may have on historic properties listed in or determined to be eligible for the National Register of Historic Places (NPS). 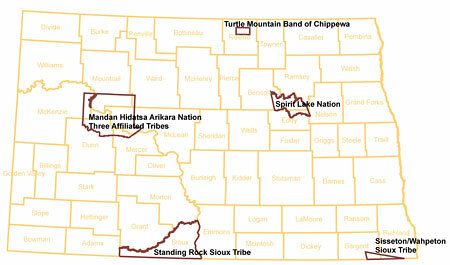 In North Dakota, Tribal Historic Preservation Offices carry out Section 106 review for projects within the exterior boundaries of Standing Rock Sioux Tribe, Turtle Mountain Band of Chippewa, Three Affiliated Tribes (Mandan, Hidatsa, and Arikara Nation), and Sisseton/Wahpeton Sioux Tribe. Spirit Lake Nation has a tribal cultural representative who should be consulted as well as SHPO. These tribes should be consulted regarding cultural resource interests outside the exterior boundaries of the reservations as well. Tribes outside of North Dakota should also be consulted regarding their cultural resource interests in projects inside North Dakota. Further information is available at the National Association of Tribal Historic Preservation Officers web page, the National Park Service's Tribal Preservation Program, and the Advisory Council on Historic Preservation's regulations regarding tribal consultation web page. There are seven Certified Local Governments in North Dakota. These groups should be consulted and notified of projects in their cities. A federal undertaking can encompass a broad range of federal activities. The activity may be an action by the federal agency itself, the granting of funds from a federal agency, or a permit approval by a federal agency. A few examples of federal undertakings include construction, rehabilitation and repair, demolition, licenses, permits, loans, loan guarantees, grants, federal property transfers. The North Dakota SHPO Guidelines may be helpful to those involved in the review process. The Advisory Council’s Citizens Guide to Section 106 Review is available at http://www.achp.gov/usersguide.html.